I'm new here but I have been here many times during searches and have found answers consistently. I hope to be able to add to the community in any way I can. I am relatively new to using photons, but as far as I've gotten is setting up the scene with the following objects: A box->shell interior as the set area, a few objects with mr A&D glass (physical), a light, and a plane in front of the light with a mental ray material applied (transmat photon in the photon slot as shown and seen in the description of the youtube vid here). I have had varying results through a trial and error process of using different light types and settings, materials, using the plane in front of the light, using parti volume in the scene. 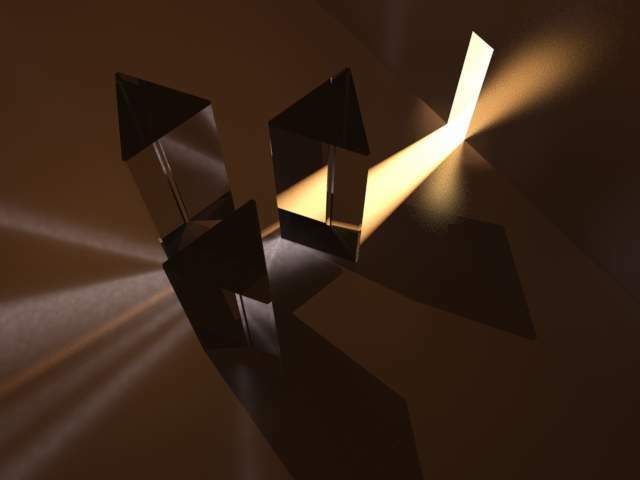 I have been playing with the manual photon settings on the light to some success I can see the caustics on surfaces but I can't seem to create the volumetric effect. I am looking into the use of parti volume but it does not seem to suit the examples, if anyone knows some tricks using the photon and photon volume channels of a mental ray material I think I need some tips. The example linked above talks about a plane in front of the light with a material that will somehow convert the photons to light volume beyond it. Maybe something changed since then, but I cannot reproduce it. I have been searching and not finding and hope someone has some experience with creating an effect like this. Which light types did you use? Did you use parti volume somehow? A mental ray shader? I noticed the time required to cast photons varied greatly between light types using the same manual settings, with photometrics taking longest. This is with a photometric spotlight, I had caustics on with a x20 multiplier, and the light was set to 1 million energy and caustic photons, with 20k of GI. Final gather was on. 100W bulb template with adv. raytrace shadows. Took 2 minutes to process all. 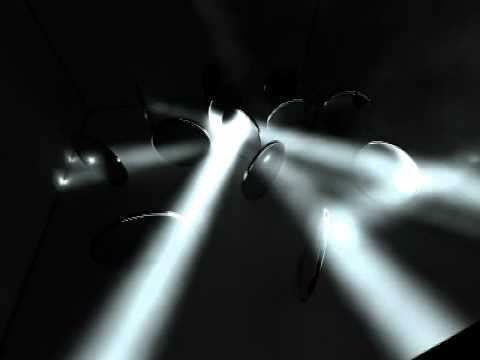 I put the same light from above in a slot in the wall and narrowed the field/falloff, doubled the caustic photons. Added a 3 cd area light to the room with a little bit of GI. Process and render time 5 minutes. 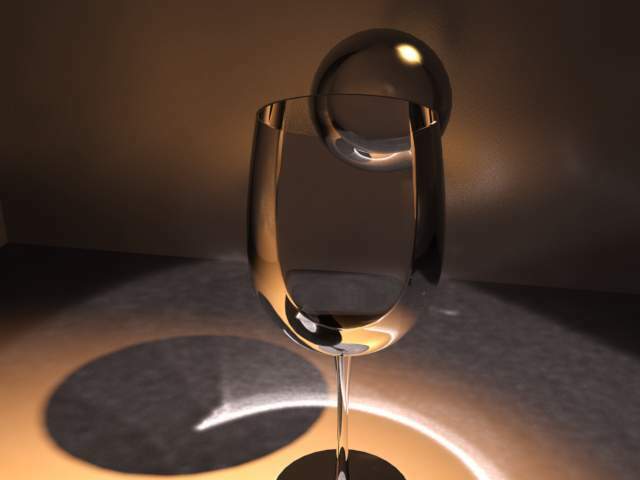 Can see the color of the light does not pick up after the first refraction. Still trying to get the volume effect so I'll try adding parti volume to the light. Parti volume with default settings, when specifying a light and an appropriate distance, appears to be absent regardless of extinction or scatter color, or I'm doing it wrong. 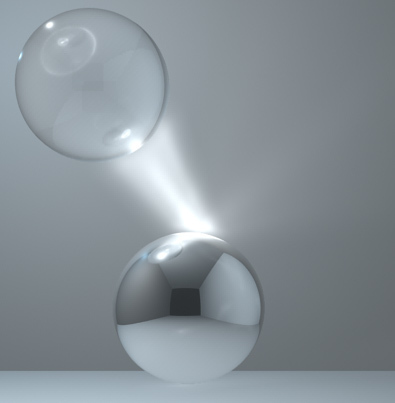 I am adding it to the camera shader..
it was apparent after 5 minutes of rendering this is not what I'm looking for, although I get the volumetric effect, it does not carry into reflections/refractions. I have tried plugging various options into the photon and photon vlume shaders within the glass material with no observable change. Can anyone help me with this?